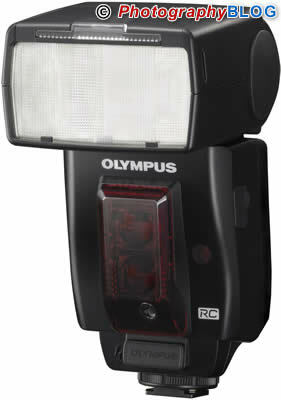 The Olympus FL-50R and FL-36R are new remote control (RC) wireless flash units, which enable flash photography minus the complication of cords and inconvenient set-ups. The high-performance FL-50R boasts multiple adjustment modes including TTL Auto and manual, and high-speed synchronisation. The lightweight FL-36R boasts power in a compact design. The remote control wireless flash units FL-50R and FL-36R will become available in November 2007 and December 2007. London, 17 October 2007 – Forget dealing with cumbersome cables when wanting to get perfect lighting for your photographic subjects. Thanks to the new Olympus remote control (RC) wireless flash units FL-50R and FL-36R, cordless lighting set-ups are a convenient reality. Both are ideal for use with the Olympus E-3 professional D-SLR which enables the control of up to three different flash groups directly from the camera – no separate commander unit is required. Photographers benefit from extreme flash unit versatility and never again need to be hindered in the studio or in the field by troublesome wires. Giving professionals the freedom and control they need to operate effectively in the studio or in the field, the FL-50R and FL-36R flash units enable flash photography minus the complication of cords and inconvenient set-ups. Control is possible directly from the camera without the need for cables. These units represent the ideal accompaniment to the Olympus E-3, which features a newly-developed RC Data Transfer System that transmits data optically. This significantly reduces the power consumption of the built-in flash when being used as the system commander. A wide range of flash-related settings can also be easily accessed and adjusted using the camera’s LCD panel as the user interface. Moreover, flash control is available in three groups, allowing flash mode and compensation settings to be set independently for each group – thus enabling ultra-precise illumination. Four remote control communication channels can be set by the user to avoid interference with other peripherals in the vicinity. Photographers also have the option to control wireless transmission distance by choosing between three signal strengths – for a range of up to 10m. And both flash models incorporate adjustable heads which can be swivelled without impeding their ability to communicate. Using their slave function, the FL-50R and FL-36R can also be used with other Olympus SLRs with manual flash facility and Olympus SP series cameras capable of slave mode operation. Furthermore, both models can also be interlocked with a large strobe in the studio. The irradiation angle of each flash unit can be set either by automatic zooming according to the interchangeable lens used or manually. Thanks to a built-in wide panel, the expansive irradiation angle required with a focal distance of 8mm (equivalent to 16mm in 35mm terms) is covered. The high-performance FL-50R boasts multiple adjustment modes including TTL Auto and manual, high-speed synchronisation – in Super FP Mode up to 1/4000th sec – and also features fast recycle intervals which can be as little as less than 1.3 sec. when using the SHV-1 Flash High-Voltage Set. The FL-50R boasts GN28 performance at a 12mm focal length (equivalent to 24mm on a 35mm camera; ISO 100) and a very powerful GN50 at a 42mm (equiv. to 84mm; ISO 100). Enhancing mobility, the lightweight FL-36R boasts power in a compact design. The flash unit allows 1/8EV-step accuracy to satisfy the high light metering precision digital photography demands. And with GN20 at a focal length of 12mm (equiv. to 24mm; ISO 100) and GN36 at 42mm (equiv. to 84mm; ISO 100), this wireless flash unit is particularly well-suited for high-action assignments. The Bounce Adapter FLBA-1 can be mounted on the FL-50R flash head and diffuses the irradiation light to soften the bounce light by attenuating the contours of shadows produced in bounce shooting. 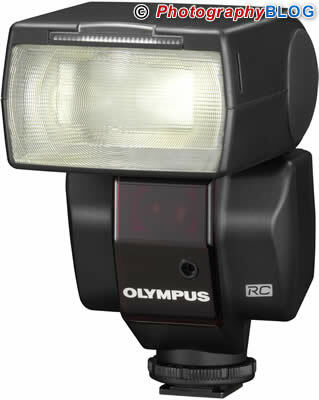 The FLBA-1 comes with the FL-50R and is also compatible with the Olympus FL-50 flash unit. FL-36R, FL-36 and FL-50 Olympus flash units. The remote control wireless flash units FL-50R and FL-36R will become available in November 2007 and December 2007, respectively. Each comes with a flash stand to ensure a steady footing during remote use. · Usual synchronisation speed 1/180 sec.